New Zealand’s general election is over. The National Party has won itself another three years in government. With a probable overall majority and the support of three fringe MPs, prime minister John Key and his cabinet will be able to do more or less what they like. Given the government’s performance on climate matters over the last six years — turning the Emissions Trading Scheme into little more than a corporate welfare handout while senior cabinet ministers flirt with outright climate denial — and with signals that they intend to modify the Resource Management Act to make it easier to drill, mine and pollute, it’s hard to avoid the conclusion that the next three years are going to see New Zealand’s climate policies slip even further out of touch with what’s really necessary. I don’t want to get into a discussion of why opposition parties were unable to persuade voters to unseat Key & Co: that’s being widely canvassed. I do want to consider what might be done to prevent the next three years being as bad as the last six from a climate policy perspective. One thing is very clear: the climate issue is not going away. While carbon emissions hit new records, the UN secretary general Ban Ki-Moon has been trying to galvanise world leaders to take the issue seriously. Hundreds of thousands of ordinary citizens have taken part in people’s climate marches around the world. And the climate news remains, as ever, gloomy. Ice melts, floods surge and sea levels continue to rise. “Business as usual” continues, but is being challenged on many levels. Gareth Morgan, the motorbike adventurer, philanthropist and prolific author, is no stranger to the climate debate. He understands the issue in the way only someone who has written a book on the subject can ( 😉 ). In a recent blog post, Morgan looked at what it might take to get climate action in the current New Zealand political climate. His conclusion? That we need a new “bluegreen” political party. But for me, the most frustrating aspect of the election result is the entrenched inability of the Green Party to grasp that the environmental message is something that appeals to middle-of-the-road New Zealanders, not just Lefties. Sadly the Green Party’s policies for environmental sustainability have always come with a nasty fishhook – the out-dated edict that social justice can only be achieved by rehashed socialism. This has rendered the Green Party a real melon to mainstream New Zealand – a watermelon to be precise, far too red on the inside for middle New Zealand to stomach. For me, the frustrating thing is that the other Gareth’s1 political analysis completely misreads what’s going on at the same time as his analysis of National government’s performance on climate over the last six years is absolutely spot on…. Author GarethPosted on September 26, 2014 September 26, 2014 Categories Climate business, Climate politics, Climate science, environment and ecologyTags Bluegreen, election 2014, Gareth Morgan, Green Party, NZ73 Comments on Where do we go but nowhere? It’s summer down south, and New Zealand’s politicians have embarked on their summer break. It’s summer in Waipara too, and with yesterday topping 30ºC and today heading in the same direction, your blogger has immediate climate concerns of an irrigation and vine management nature to attend to. So, with apologies for what may turn out to be less frequent posting over the next few weeks, here’s a quick round-up of stuff worth reading. The Government’s climate change policy is a shambles and a disgrace. Unless, that is, you are happy for the costs of the inevitable adjustment to a low-carbon future to be needlessly increased and pushed onto the young, in which case it is doing a great job. On the eve of December’s Copenhagen conference on climate, all indications are that there will be no legally binding obligations agreed to by nations insofar as carbon emissions are concerned. The inability of civilisations to pre-empt catastrophe is nothing new: history is littered with instances of societies marching steadfastly to oblivion in full knowledge that this is the consequence of their inability to change. Jared Diamond’s book “Collapse” provides a perceptive and sobering historic collation on this topic. Our genetic code commits us to paths portending self-destruction, albeit this time the threat is on a scale hitherto not encountered. There is no compelling reason to doubt the view that human activity is causing a rise in the atmospheric concentration of greenhouse gases, and that this in turn will lead a rise in global average temperatures, we can expect the effects of climate change to be making themselves felt in earnest in 2020. And we can probably expect the rise in temperature to be faster than the currently favoured predictions, given that most of the new evidence that emerges daily suggests that the world is warming more and faster than had been expected by those who compiled the IPCC’s Fourth Assessment Report. So what – if our disposition for denial dictates we adhere to insufficient pre-emptive action – might be the worst of the scenarios we face in 2020? The rate of growth in global emissions of greenhouse gases will have slowed, but it won’t have reversed, as we so badly need it to have done by then. After the debacle at Copenhagen, it will have taken several years for international accord on meaningful reduction targets to be reached. Some nations will have made great strides in reining in their emissions, and some may even have cut them, but New Zealand, like most other liberal democracies (including the United States), will be lagging behind our commitments. The tough decisions that need to be made will have continued to prove just too tough for politicians eyeing their re-election prospects. Centrally planned economies like China, by contrast, and some of the more socialist European states will have taken strong, concerted action. The worldwide search for truly sustainable energy sources will have begun in earnest as stocks of easily obtainable petrochemical resources have become depleted, sending the cost of energy soaring, and this will be the single greatest contributor to the slowdown in the rate of fossil fuel consumption. New Zealand, like most other liberal democracies (including the United States), will be lagging behind our commitments. Ironically, our regional average temperature may have cooled over the decade, which would be of considerable comfort to climate change sceptics if only there were any left outside asylums for the chronically deluded by 2020. Higher rainfalls on the Main Divide in the South Island will make water shortages in our hydro lakes something of a rarity, and this will improve our energy security and reduce the quantity of fossil fuels we consume in energy production. The excess electricity in the grid initially released by the long overdue closure of the Rio Tinto aluminium smelter at Tiwai Point will be mostly offset by 2020 through its increased consumption by the burgeoning national fleet of battery electric vehicles. This will work an improvement in the efficiency and the renewable component of the energy consumed by our transport sector, and this in turn will comprise the major component of the slow-down in the rate of New Zealand’s increase in greenhouse gas emissions. Just behind this will be the impact of measures imposed by the government to improve the energy efficiency of domestic and commercial buildings. The third largest contribution will be the carbon offset earned by the re-aforestation of land that was formerly used for agriculture. But agriculture — particularly dairy — will prove resilient: although New Zealand agricultural products will become steadily more expensive on the world market with the addition of a price premium to reflect ‘food miles’, the reduction of demand further afield will be replaced by increased demand from Australia, whose agricultural sector will be under severe pressure. But never mind all that. Housing will be trucking along, as a new generation of Kiwis assembles a portfolio of renters to let to the huddled masses of climate refugees arriving here from the Pacific and from the poorer parts of Asia and the subcontinent. The prices of beef, lamb and seafood will have plummeted as supplying the domestic market becomes more attractive than exporting. Author GarethPosted on November 25, 2009 December 18, 2011 Categories environment and ecology, Imagining 2020Tags Gareth Morgan, Imagining 2020, John McCrystal5 Comments on Imagining 2020: A Low Carbon Future? Bah! Humbug! Reports from this week’s 2020 target consultation meetings suggest that Nick Smith and Tim Groser (replaced in Christchurch by Adrian Macey, NZ’s climate ambassador) have had to face up to pretty solid support for a 40% target. Greenpeace laid on a star-studded night in Auckland (Jim Salinger told me today he enjoyed his date with Lucy Lawless), and there were certainly plenty of Sign On and 350.org people in the Christchurch session, as well as another voluble Gareth. The ODT and 350.org.nz report that Dunedin was much the same. My reactions to Nick Smith’s presentation in Christchurch were mixed. He made all the right noises about supporting action, and emphasised that he was willing to work with Labour to achieve a lasting policy consensus — which is a key step in delivering certainty on the long term direction of policy. I have no doubt, given his comments, that an emissions trading scheme will emerge from the ETS Review process, but remain somewhat sceptical about how watered-down it will be. Smith was too keen to emphasise how hard it would be to make emissions cuts, yet did little more than pay lip service to the carbon sink side of the equation, and seemed able to quote at will from the Greenhouse Policy Coalition’s recent “40% will be too expensive” economic forecast. I sat with AndrewH, and saw more than a few familiar faces in the crowd. It may have been the only public meeting in NZ history when two alumni of St Catherine’s College made short speeches (hi Rhys). Did I imagine seeing Smith and Macey sit up a little when I challenged them to move from 50 by 50? Overall, I was impressed with the passion of the contributions made from the floor, except possibly for the poor soul who spoke last. 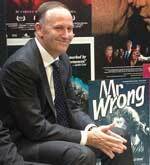 He spoke glowingly of Ian Wishart’s Air Con (to a smattering of polite boos), only to be advised by the Minister that Gareth Morgan’s Poles Apart was the better, and more accurate, reference. The targets roadshow continues next week with public meetings in Hamilton, Napier, New Plymouth and Nelson. The ministers also have a session at the Institute of Policy Studies at VUW on the 15th which is by invitation only (I’d love to hear the proceedings) and a meeting with the Iwi Leadership Group. You can make submissions direct to Nick at n.smith AT ministers.govt.nz, and he will be taking part in a webcast panel discussion live online on Monday 20 July at 7-30pm here. Questions in advance to: 2020target AT mfe.govt.nz. No excuses. Make your voice heard.